Champagne is by far one of my favorite wines to drink no matter what the occasion. So what better wine to kick off the blog with?! I’ve always enjoyed the elegance and ceremony associated with drinking Champagne. Something about the popping of the cork and the sound of the bubbles exploding with flavor as it fills the flute tantalizes all of my senses. Moet got its name for its flagship Champagne, “Epernay,” from Napoleon while he was visiting their vineyards. Napoleon also awarded Jean-Remy Moet one of Frances highest honors, the Legion d’honneur. Moet has been used to celebrate sports victories since 1966, when race winner Jo Siffert used a bottle of Moet to spray fans at the “Le Mans” 24 hour car race. Medium Bodied 12 % Alc By Vol. 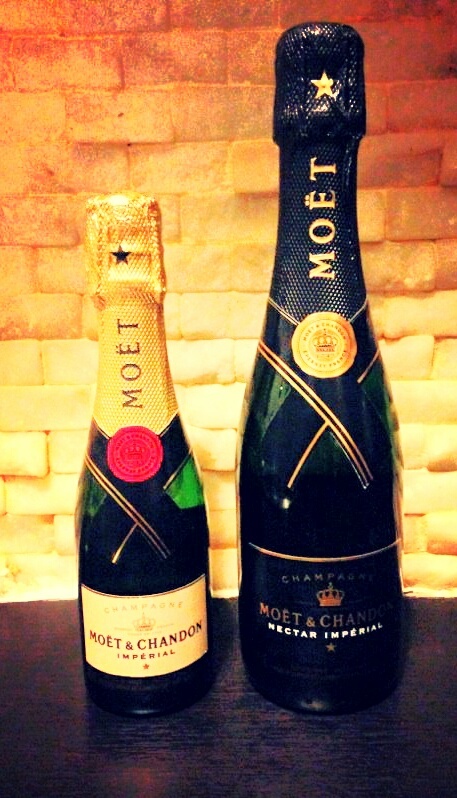 Created in 1869, Imperial has become Moet’s most iconic blend. This Champagne is designed to be Brut in its nature though I feel it exudes subtle qualities similar to those of a “Sec” or semi-sweeter wine. The nose bursts with Meyer lemon, white peach, apple, and lime blossom. On its heavier side, you get deeper aromas of honey and brown sugar. The palate surprises with a distinctive granny smith apple laced with some lemon zest. Its body is delectably crisp finishing with a round tartness that leaves the palate longing for more. Perfect as an aperitif or paired with baked brie, caramel, sushi, oysters, caviar, creamy or buttery sauces. Light/Medium Bodied 12% Alc By Vol. Nectar Imperial takes the brand’s iconic blend Imperial and highlights the fruitier, sweeter qualities rather than the drier qualities of its original Brut blend. The nose starts off light with hints of fresh creme brulee and baked apple finishing off with milder citrus notes and a lingering note of honeysuckle. The palate rushes in with the sweetness of ripe white peaches and a hazy note of lemon zest. Accent notes of sweet honeydew and syrupy honey lace the wines amazing balanced tartness as it dances over your palate. Spicy dishes and blue-veined cheese are this wine’s best friends. This wine is also an exquisite choice to drink as an aperitif, with caviar and oysters, or as a dessert wine. These both sound delicious! I’ll be sure to include them at my next dinner party. Can’t wait to see what you taste next!